Android Pay, Google’s go at NFC-powered mobile payments, is beginning its launch today. The arrival of Android Pay gives Android smartphone owners the option to check out in line faster, and potentially, more secure than ever with contactless payments at over one million locations around the US. If you own an Android phone equipped with NFC capabilities and is running KitKat 4.4, you’ll be able to access the Android Pay app through Google Pay in the next few days. However, if you’re a current Google Wallet user, you’ll enjoy immediate access to the new contactless payment system through an app update. The service, which was first teased at this year’s MWC conference in Barcelona, then fully unveiled at this year’s Google IO developer conference, works similarly to Apple Pay. Both share the common goal of slimming down your wallet by eliminating the need to bring your credit and debit cards with you when you head to the store. When you pay for something using Android Pay, your card’s number is cloaked by a tokenization process that Google claims to be the industry standard. At the time of writing, Google didn’t highlight its plans for a global rollout of the new payment system. 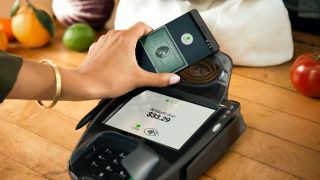 While it’s disappointing news for readers outside of the US, it’s likely that Android Pay will only remain exclusive until all the bugs have been fixed. For some context on how long that might take, it took Apple Pay nearly 9 months to make the jump across the pond to the UK. Hopefully, it won’t take Google so long.